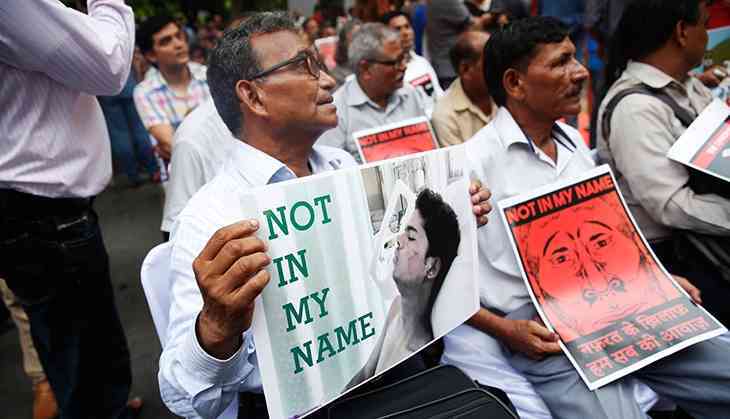 Home » india news » NotInMyName: Thousands in Delhi protest mob lynchings, but will BJP take notice? NotInMyName: Thousands in Delhi protest mob lynchings, but will BJP take notice? 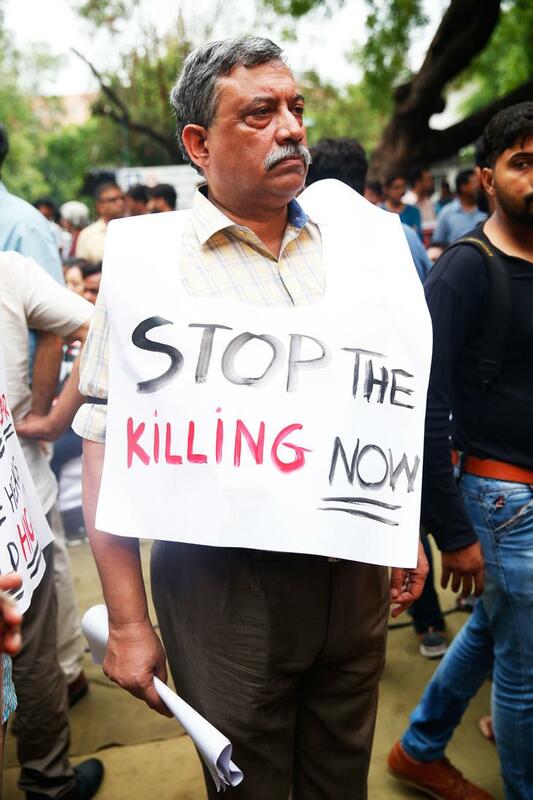 Just two days ago, on 26 June, Union Home Secretary Rajiv Mehrishi stated that the recent spate of mob lynchings were “over hyped” – a media-created sensation, unworthy of real attention. 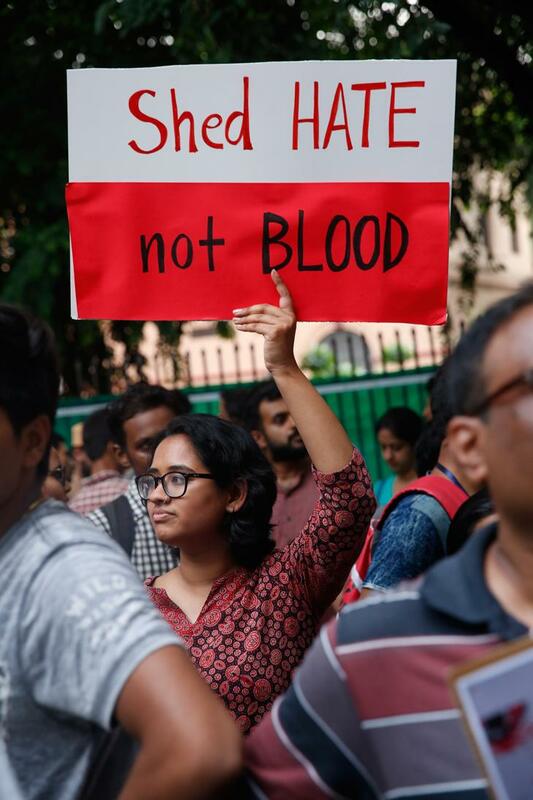 However, not even two days later, protests have sprung up across the country - from Bangalore to Delhi - with one clear message: The current climate of mob violence is unacceptable. In Delhi, where stormy weather threatened to play spoilsport, protesters still showed up in droves. Even before the designated starting time of 6PM, as the large stage was still empty and sound systems were just being tested, protesters started to show up, some alone, some in groups. Conservative estimates peged the number of protesters at around 2,000. And speak up they did. As one moved through the crowd, murmurs about the lynchings were very audible. “Pehlu Khan”, “Junaid”, “Muslims”, “Dalits”, “gau rakshaks”, were keywords that seemed to repeat in every second conversation. Clearly, the lynchings over the past year have created a climate of fear that had rattled the gathered protesters. While the real success of the protest will obviously be measured in the ruling dispensation's response, the crowd's verdict on the protest was mixed. Journalists, including this one, wondered how many in the crowd present were members of the media fraternity, and how many were actually just protesters. It wasn't hard to understand why, either, as the number of journalists covering the event, and those just attending it almost made it seem like the nearby Press Club had changed venue. That being said, it would be unfair to dismiss the gathering as insignificant. For a Wednesday evening, with storm clouds hovering, a spell of heavy rains having lashed the city, and hardly three days notice, the thousands who showed up should not be dismissed out of hand. Their desire to show up, even as traffic snarls and puddles gave them excuses to remain armchair protesters. The oppressive humidity, and the eventual storm that did see the protest end was ample evidence of the obstacles people refused to be deterred by. The crowd was also unique for the lack of political patronage. 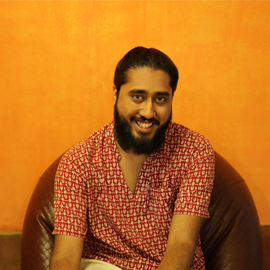 While Kanhaiya Kumar, Umar Khalid, Shahid Siddiqui and a few AAP members were present, the Congress was almost entirely unrepresented barring a lone appearance by Shehzad Poonawala. If the opposition parties wanted to raise this issue, this would have been the perfect time and place. Their general absence spoke volumes about how washed up and invisible opposition parties currently are. The protest was also uncharacteristic in its tone and tenor. 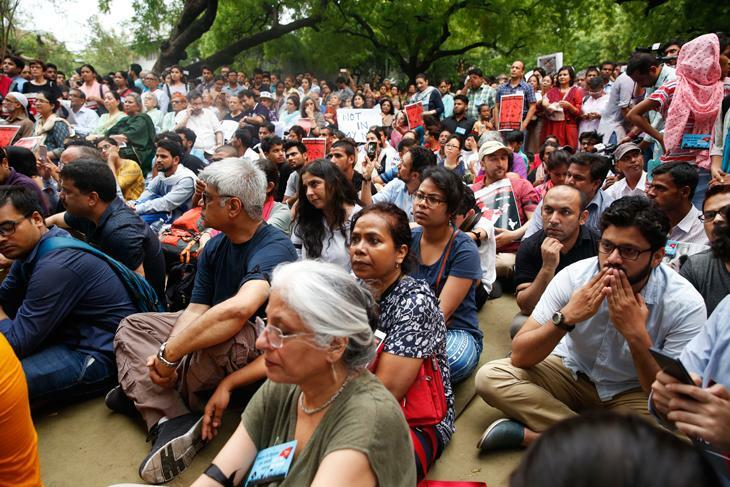 While social media had us expecting a loud, raucous condemnation of the mob violence, what actually transpired was markedly less loud than the usual Delhi protest fare. There was no loud sloganeering, and no firebrand speeches. Just solidarity. More than protest the crowd merely stood together in solidarity, as relatives of lynching victims, activists, poets, and even singer Rabbi Shergill took to the stage. There was no loud sloganeering, and no firebrand speeches. But perhaps in the present atmosphere of violence, noise and hatred, this was for the best. Perhaps just the solidarity, the coming together of thousands to denounce violence, was enough for those gathered. And perhaps that solidarity will finally get a slumbering government to wake up and take notice of the horrors and atrocities that are happening in its name.